Having a child is one of the greatest achievements one can have in life. It is one of the greatest joys and is going to change your perspective on life forever. However, with having a baby comes a lot of additional costs and things to think about. This is a new human being brought into the world that is going to need all of your help to survive. This includes clothing them, feeding them, and giving them something to be entertained by. It is crucial that you take the time to purchase baby items before having the baby, so you are ready for when they arrive. This is common practice between the later stages of pregnancy between 6 to 9 months. One great purchase for a baby is a great baby jumper. Baby jumpers allow a baby to get used to standing on two legs and are a great place to keep them occupied while you are busy doing other things. They also allow your little one to exercise and build leg muscles while in the jumper You never want to turn your back on a baby in case they are doing something dangerous, but baby jumpers allow you to know that they are secured and entertained while you are doing other things. If you buy the best baby jumper, it will also be able to last a long time, allowing you to use it for any additional babies in the future. The very first thing whenever purchasing a product for a baby is to find one that is safe; this is definitely important for a baby jumper. You want to ensure that is has a great grip on the baby, and that the springs are covered and are not going to hurt the child. As well, you want to find one that has a lot of range of movement for the baby. This baby jumper is made out of plastic, polyester and metal, making it very well-made and durable. This ensures that it is going to last a long time without breaking, especially when a baby uses the jumper every day. A Fisher-Price staple is going above and beyond the “norm” so this one has built-in music, sound, and lights when a baby starts jumping. This encourages a baby to jump, ensuring that they are getting the most out of their jumper, as they feel rewarded when they do it. This will increase the strength of their legs and they will be more inclined to start walking early. The frame of this jumper is made of sturdy freestanding steel. This lets a baby jump safely anywhere, and it does not need to be attached to a door. What makes this baby jumper special is that it has three adjustable positions; this allows it to grow with your baby, letting it last a long time and is worth the reasonable price at first. The soft spring covers attached to this jumper make it very safe for a baby’s little fingers, and you do not have to worry about injury. Since this is a Fisher-Price brand, you are guaranteed good customer service and a great return policy. The Baby Einstein Rhythm of The Reef Activity Saucer is made of both polyester and plastic, able to withstand any mess that a baby can make. This product is entirely made in the USA, something that the Baby Einstein company is very proud of. There are over 12 activities to stimulate the baby’s brain on this jumper; these include a light-up piano to let them learn music, and 3 play modes to learn melody and notes on a piano. As well there is a language learning feature to learn English, French, and Spanish. The seat has the ability to rotate 360°, so the baby can have full access to all toys on the device. This will occupy them for a long amount of time and they will not lose attention easily. As your baby grows, so can the Baby Einstein Rhythm of The Reef Activity Saucer. There are 5 height positions to choose from, more than a lot of the other best baby jumpers on the list, so it can go from a small baby to a pre-toddler. In order to store it easily, it can lay flat, and also has a built-in storage tray. The seat pad can be easily cleaned, just in case any accidents that are common with babies happen. 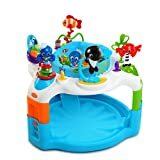 All of these features, at a competitive price, make the Baby Einstein Rhythm of The Reef Activity Saucer definitely a contender for the best baby jumper. The Fisher-Price Rainforest Jumperoo is a baby jumper that has been designed with the rainforest in mind. Babies love animals and this allows them to feel like they are a part of the rainforest, with flying birds and bugs over their heads and more animal products to play with. It is an attractive baby jumper and one of our favorite designs on the list. This has been made for a child who is already at an age to hold up their head without an adult’s help. This is crucial for safety. As well, it is not built for a baby that can walk by themselves and climb out. This product does not need a doorway and lets the babies jump wherever you want them. This makes it a lot safer, allowing you to choose where you want them to play. On the device are lights, sounds, and music that work when the baby starts jumping. This encourages them to jump all the time, as they are rewarded for their actions. What makes The Fisher-Price Rainforest Jumperoo unique is that it has a soft-sided overhead bar that toys can be placed on. The toys included a squirrel roller ball that kids love and also two woodland friend spinners, more to add to their animal toy collection. The piano included on this baby jumper can light up when they play, and also stimulates their musical mind. 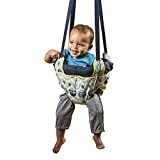 This baby jumper is very easy to use and very easy to take down; this makes it really portable and the frame can pivot to a nested position, allowing it to be tucked easily away. The seat that they baby is on can rotate 360° so they can access all of their toys; this engages the baby on all sides, letting them have fun for a longer period of time. They simply won’t want to get out of this baby jumper. The Fisher-Price Woodland Friends SpaceSaver Jumperoo has been inspired and designed with animals. This is one of the more affordable Fisher-Price options, as it is not as advanced as others of their line, but it still has a lot to offer. First off, as with all of their jumpers, it has been designed for a baby that can hold up their head by themselves. This is crucial as it does not have the support that a newborn would need to keep their head up, and can lead to unsafe conditions. On top of that, a 2 or 3 year old that can already walk and can easily climb out should not use this device. Fisher-Price has thought about safety before anything on this product. First off, it can be set up anywhere and does not need a door way to be hung up. This allows a parent to choose where is the safest and most convenient place for the baby to play. As well, the springs on the jumper have been enclosed by fabric, ensuring that your baby’s hands or fingers will not get caught in them. Every time the baby jumps, they are rewarded with flashing lights, a variety of sounds, and even music. This is a staple with all the Fisher-Price baby jumpers, because they understand that this will encourage a baby to jump more often. Jumping engages the babies’ legs and encourages them to get to the walking stage earlier. There is an overhead toy bar that is very soft that comes equipped with a roller ball with a squirrel in it, and two Woodland Friends spinners for them to play with. They are going to fall in love with these new friends of theirs and they will not want to leave! This baby jumper is made out polyester that is very durable and is going to last a long time. It has been intended for a child that is out of the “newborn” stage, and has the ability to hold their head up by themselves, as there is no head support in place. At the same time, it is also not built for a baby who is large enough to walk and climb out of the jumper by themselves. As the baby is growing, this jumper can grow with them. This is crucial as it is definitely going to last you over a year. There are three different heights that you can choose from, to ensure your baby is comfortable and fits well. The springs on the jumper are covered with soft material to keep your baby’s fingers safe from any pinching. There is music that plays when they jump, to encourage them to move, and it has the ability to last consecutively for 10 minutes. For easy cleaning, the seat pad can be removed and put in the washer and dryer. This is a baby jumper that can only be used in a door way. This limits the number of places that you can use it. There is a sturdy bounce spring in this baby jumper that allows little legs to use it and jump. Although it is used in a door way, it will not mark up the frame, as it is equipped with the Graco’s no-mark clamp. The Graco Bumper Jumper, Bear Trail can easily be transported to any room in the house that you want (within a door way), so you can always keep your eye on your child. The seat pad that comes with this is easy to wash, and can be placed in the washing machine. The straps are easy to use and are non-twist, so you can get your baby in and out with ease. This is a door way baby jumper again, and can fit most standard doorways that measure 3” to 6” thick. Jumping allows your baby to increase their leg strength. The framed seat fully surrounds the child, ensuring added safety as they use it. The spring is fully enclosed, so the baby can touch it all they want without injury. The straps that come with it are fully adjustable and can adjust height while your baby grows.
. This is one of the more advanced baby jumpers on our product today. The Jolly Jumper has made quite the name for itself as being a more high-end baby jumper with a variety of features. This jumper has been made to build a baby’s strength and overall coordination in a comfortable situation. This is a door way baby jumper, and comes with a door clamp that is sturdy and will not fall. This jumper provides a baby with full freedom of movement. Babies can use this as early as three months.